Free information about smoking poultry you should know. Excellent Information About Smoking Poultry. Smoking Poultry is a great way to make the ordinary into the extraordinary. Most people assume turkey and chicken are the only domesticated birds, however duck, pheasant, geese and many others are also farm grown for the consumer. Due to the fact that most birds have a low fat content, it is easy to dry out the meat in the smoking process. Fortunately, if you soak it in a brine solution you can achieve a moist and juicy product. You can also add sugar, juice, wine, herbs and spices to the brine solution. This will help in adding extra flavor by absorbing into the meat, along with the saltwater. Whatever bird you decide to smoke be sure to preheat your smoker to about 200 degrees prior to cooking. This helps stop the growth of unwanted bacteria during the heat-up process. By adding wood chips such as hickory, oak, mesquite, apple or any other hard wood, the meat will absorb a delicate, smoky flavor. If you extend the amount of time you use smoke, a richer, deeper flavor can be achieved. Be aware that too much smoke can cause a bitterness or just too much of a good thing. Be careful about overdoing it. When the internal temperature reaches 160 degrees, as checked with a meat thermometer, or if you can easily twist the drumstick with the meat pulling away from the bone the poultry is done. Put on your apron and lets get lets get smoky! Smoked turkey in five easy steps. 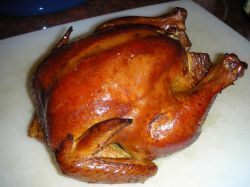 Smoked chicken is a great alternative to frying or grilling. Smoked Duck ...Here’s How It’s Done. Smoked goose ...A Rich And Wonderful Eating Experience!